If you want, read along with me as I parse my way through MFA program reading multiple books a month. I already have to write these annotations (metadata, comments, review, diagnostics) so may as well share some of my favorites. It’ll be like an online book club. Most of the time, but not all, it will be a look at craft. How the writer accomplishes what they are doing on the page. 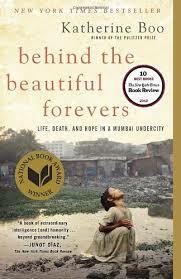 Behind the Beautiful Forever’s is the first book by Katherine Boo, surprisingly. However, Boo’s work as an investigative journalist for the helped develop her highly detailed work as a writer and she’s written for both the Washington Post and The New Yorker covering themes of social justice. In other articles she’s explored the intellectually disabled, poverty, welfare, and marriage. You could perhaps call Forever’s “Micro-focused.” This is both the main strength of the book and perhaps it’s main criticism. It touches briefly on the state of India’s economy, caste system, globalization, etc., but for the most part the book is a highly detailed account of a small group of people in a slum across from the Mumbai airport—a family of Muslim garbage pickers, a one-legged woman, a woman “mob” boss of the village with political aspirations (basically a smart woman who runs the village through bribes and money while also working with the local government and law enforcement), her educated daughter, and some tragic young men who do anything they can to make some money. It’s been hailed as the best book on India in twenty-five years. This is the strength of Boo’s work. The nuance and delicacy and realness she doesn’t shy away from when detailing the lives of the people she’s chosen to follow. They’re complex humans, each with their own sense of morals, character, perspective, aspirations, and so on. Boo’s book also sheds light on some of the broken and misleading truths with regards to NGO’s and nonprofits. There’s one scene in which the local leader of the village, pays people to come to the unveiling of a new well built by a NGO, so they can put on quite a show to the rich Americans and hopefully get some more money. The money and well were obtained, of course, through bribes and local corruption, as is the norm in India and many other developing countries. However, while the book is a stunning and complex portrait of people living in poverty, many readers could be frustrated with Boo’s failure to bring in hardly any outside social commentary or, “So what?” factor. It’s a terrific portrayal of Mumbai slums and a look inside the thoughts and lives of people who live in them, but Forever’s leaves a bit of an empty feeling, which is perhaps Boo’s intent.